The swans returned following the last spell of icy weather on Jean’s birthday, 23rd Jan. but spent only a few days on the pond before the ice returned. 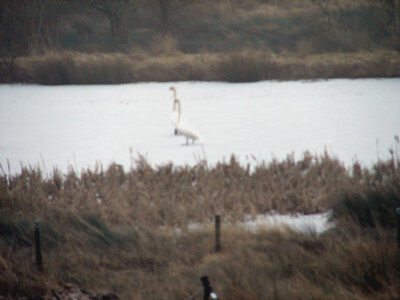 In this, admittedly pretty awful photo, we see them waddling across the frozen over water just before taking flight and disappearing again. That they quickly return once we have open water again makes us hopeful that they intend to spend the breeding season with us. 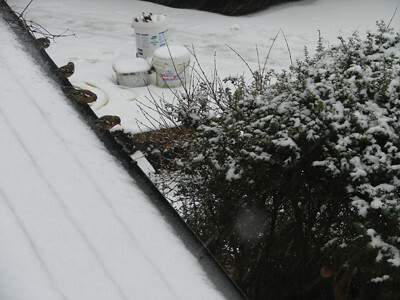 Chaffinchs queueing on a gutter in todays snowy conditions, waiting their turn on the bird feeders, all of which were very busy all day long.